Portable Chlorine (Cl2) gas detector has measuring ranges of 0 to 10/20/50/100 ppm for your selection, and give alarms with sound, light and vibration. Chlorine gas detector use high precision sensor, with self & zero calibration function, to provide a more reliable safeguard. Hydrogen Sulfide (H2S) gas detector, fixed, is used to monitor the H2S concentration in different kinds of environment or pipeline and alarm with sound and light, to safeguard the organic life. Unique infrared ray control function, which can remote control the device. With self-calibrationa ans zero calibration function, it makes the detection more accurate and reliable. 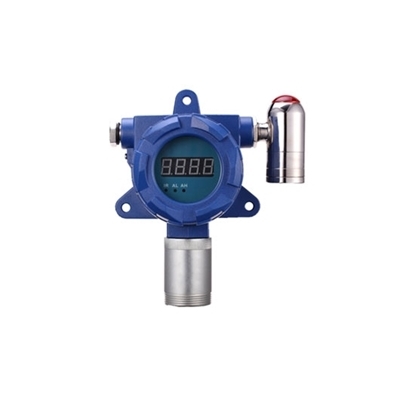 With temperature and pressure compensation, this is able to realize the gas concentration compensation under the conditions of different temperature. Infrared ray controller can remote control the alarm point settings, zero calibration, and address modification. Can output one or two on-off signals, and can drive ventilator, solenoid valve or other external devices. 1. Ammonia (NH3) detector shall not be installed in the place which has high concentration of smoke, jet-propelled insecticide and combustible solvent (coating), otherwise it may cause an alarm. 2. Ammonia (NH3) gas detector shall not be installed at the place with large wind flow, such as the vent, ventilator and door. It may affect the accuracy of ammonia detector. 3. The ammonia detector shall not be installed at the place with much water vapor or water drops (relative humidity is above 90%), otherwise the ammonia sensor may be damaged for being placed in water vapor for a long term. 4. The ammonia detector shall not be installed at temperatures below -30℃ or below 50℃. 5. The ammonia detector shall not be installed in a strong electromagnetic field. 6. As soon as the ammonia detector sends a concentration alarm signal, the output control signal will be locked, even if the gas concentration doesn’t continue to exceed the limit, the controlled device is still unable to restore the pre alarm state automatically, manual reset is required (press the reset button or self-calibration for 3 seconds). 7. The ammonia detector shall be installed in a higher place of the farm because the concentration of ammonia is lighter than the air. 8. If alarm, the ammonia concentration has exceeded the set alarm concentration. After the cause for excessive ammonia concentration is removed, press the reset button to clear the alarm data. 9. It’s normal for the alarm sound in the first power-on in case the ammonia detector has been powered off for a long time. 10. After the ammonia detector is fixed, do not move its position at will, so as not to damage the accessories.